The legal instrument by which a person disposes of his property, or of a part thereof, and which takes effect after his death, but the provisions of which may be changed or revoked at any time before death. 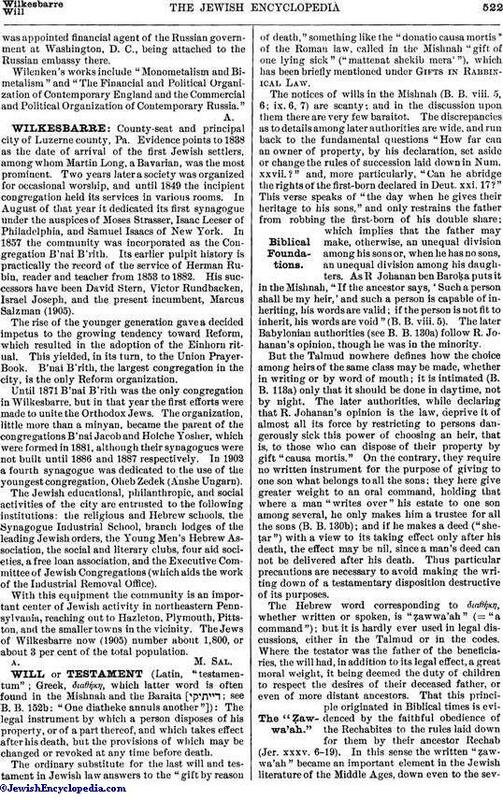 The ordinary substitute for the last will and testament in Jewish law answers to the "gift by reason of death," something like the "donatio causa mortis" of the Roman law, called in the Mishnah "gift of one lying sick" ("mattenat shekib mera'"), which has been briefly mentioned under Gifts in Rabbinical Law. The notices of wills in the Mishnah (B. B. viii. 5, 6; ix. 6, 7) are scanty; and in the discussion upon them there are very few baraitot. The discrepancies as to details among later authorities are wide, and run back to the fundamental questions "How far can an owner of property, by his declaration, set aside or change the rules of succession laid down in Num. xxvii.?" and, more particularly, "Can he abridge the rights of the first-born declared in Deut. xxi. 17?" This verse speaks of "the day when he gives their heritage to his sons," and only restrains the father from robbing the first-born of his double share; which implies that the father may make, otherwise, an unequal division among his sons or, when he has no sons, an unequal division among his daughters. As R Johanan ben Baroḳa puts it in the Mishnah, "If the ancestor says, 'Such a person shall be my heir,' and such a person is capable of inheriting, his words are valid; if the person is not fit to inherit, his words are void" (B. B. viii. 5). The later Babylonian authorities (see B. B. 130a) follow R. Johanan's opinion, though he was in the minority. But the Talmud nowhere defines how the choice among heirs of the same class may be made, whether in writing or by word of mouth; it is intimated (B. B. 113a) only that it should be done in daytime, not by night. The later authorities, while declaring that R. Johanan's opinion is the law, deprive it of almost all its force by restricting to persons dangerously sick this power of choosing an heir, that is, to those who can dispose of their property by gift "causa mortis." On the contrary, they require no written instrument for the purpose of giving to one son what belongs to all the sons; they here give greater weight to an oral command, holding that where a man "writes over" his estate to one son among several, he only makes him a trustee for all the sons (B. B. 130b); and if he makes a deed ("sheṭar") with a view to its taking effect only after his death, the effect may be nil, since a man's deed can not be delivered after his death. Thus particular precautions are necessary to avoid making the writing down of a testamentary disposition destructive of its purposes. The Hebrew word corresponding to διαθήκη, whether written or spoken, is "ẓawwa'ah" (= "a command"); but it is hardly ever used in legal discussions, either in the Talmud or in the codes. Where the testator was the father of the beneficiaries, the will had, in addition to its legal effect, a great moral weight, it being deemed the duty of children to respect the desires of their deceased father, or even of more distant ancestors. That this principle originated in Biblical times is evidenced by the faithful obedience of the Rechabites to the rules laid down for them by their ancestor Rechab (Jer. xxxv. 6-19). In this sense the written "ẓawwa'ah" became an important element in the Jewish literature of the Middle Ages, down even to the seventeenthcentury. But such an instrument, if written during good health, had only a moral sanction, even as to the disposal of property, which the civil judge could not enforce. An owner of property can make a revocable disposition, taking effect after death, only in the form of a "gift of him who lies sick"; in other words, such a disposition can be made only when death is apparently very near; and if the danger present at the time of the gift passes away, the gift is ipso facto revoked. But this kind of gift differs very broadly from the "donatio causa mortis," which has been adopted by the probate and equity courts from the Roman law into the laws of England and America; for the latter gift is valid only when followed by delivery or such other formalities as the nature of the thing given demands in gifts "inter vivos," while the Talmudic gift "causa mortis" requires no formality whatever, not even an appeal to the bystanders, as, "You are my witnesses that I give this to NN." There is this difference between the "gift of one lying sick" and a true testament; while the latter disposes of all that the testator owns at the moment of death, the other takes effect only on the property which the donor has at the time of the gift. Thus, if a man says, "My wife shall take a son's share," though the share may be increased or may be lessened by the subsequent death or birth of sons, it will be only a share in the property which the donor owned when he spoke the words (B. B. 128b). Says the Mishnah (B. B. viii. 5): "If one says, 'A, my first-born, shall not have a double share,' or, 'My son B shall not inherit among his brethren,' it is without effect; for he declares against what is written in the Torah. But if he divides his estate among his sons by his words, giving more to one than to another, or making the first-born equal to the others, his words are valid; only he must not speak of it as 'inheritance,' but must call it 'gift' somewhere in his spoken or written words." The technical formula "gift of one lying sick" ("shekib mera'"; this Aramaic phrase is used in the Mishnah) really denotes the revocable gift; and as the removal of the danger revokes the gift, it was usual for the witnesses to it to draw up a minute containing the following or equivalent words: "This gift was made when he was sick and lay on his bed: and from this sickness he departed for his eternal home." R. Eliezer, who represents in the Mishnah the position that the gift "causa mortis" is not effective without "ḳinyan," cites the well-known incident of a man of Meron (Galicia) at Jerusalem who wished to make a gift of movable property to an absent friend, and found no legal way except to buy a piece of land and then to make a deed conveying the land and the movable property together to his friend; he is told in answer that the man proposing to make the gift was evidently in good health (B. B. 156b; comp. Yer. Pe'ah 17d). The gift of one who is sick is, as stated above, valid without the specific acts which ordinarily are necessary to pass a title; e.g., in the case of land or slaves, without deed, payment of price, or occupation; in the case of movable property, without "pulling"; in the case of demands, without the "meeting of three"; and the heirs can not release a demand that has been thus given away. While, according to the Mishnah, the majority uphold the position that such a gift can be made without ḳinyan and without writing only on the Sabbath, the contrary opinion, that the writing can be dispensed with on week-days also, prevailed afterward; and the Talmud declares that the words of the sick man must be deemed just as effectual as if they were written, sealed, and delivered. However, even the Mishnah cites the case of the "mother of Rokel's sons," who told her sons to give her valuable cloak to her daughter, the wish being enforced after her death. Where the sick man gives away his whole estate with those formalities by which titles pass (ḳinyan), the act is nevertheless treated as revocable and as taking effect only on the donor's death; but, if he sets aside for himself "any land whatever" (according to the Mishnah) or "any movable property whatever" (according to later authorities), the gift is valid and irrevocable. The Talmud, however, provides that the part reserved must be sufficient to enable him to earn his living. Still the bystanders are encouraged to help the sick man in passing title to the donees whenever he desires to do so, on the ground that it will tend to calm his mind; and they may do this even on the Sabbath, so far as it can then be lawfully done; but it could hardly have been the intent of the sages to encourage a course of action which would leave the sick man penniless in case he should recover. The most effective method of making a gift is to acknowledge the property right of the intended donee as already in force; e.g., one may acknowledge that one owes A a thousand zuzim, or such a horse, or such a slave; or that a certain sum in the hands of a named person (the sick man's debtor) belongs to A. If the sick man wishes to give anything to an idolater, he can do it only in this way, as a direct gift would not be enforced by a Jewish court. R. Marc, the son of Issur the convert, was begotten "not in holiness" (i.e., he was begotten before his father's conversion); therefore when Issur wished to leave him a sum of money then in the hands of a debtor, which money represented the bulk of his estate, he was told that it was against the policy of the Law to permit him to leave his estate by gift "causa mortis" to a son incapable of inheriting it (see Derelicts). A way out of the difficulty was then shown him; this was to acknowledge before the witnesses that the sum of money already belonged to R. Marc. It seems that the heirs are estopped by the acknowledgment of the ancestor and can not question its truth. 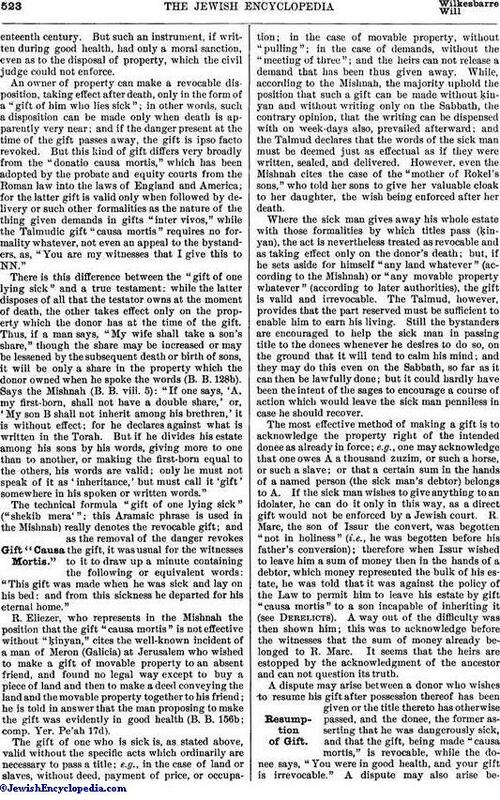 A dispute may arise between a donor who wishes to resume his gift after possession thereof has been given or the title thereto has otherwise passed, and the donee, the former asserting that he was dangerously sick, and that the gift, being made "causa mortis," is revocable, while the donee says, "You were in good health, and your gift is irrevocable." A dispute may also arise betweenthe donor's heirs and the donee, in the case of a gift not completed by ḳinyan, the former saying, "He recovered from the sickness in which he made the gift, and afterward died from another cause." The masters of the Mishnah differed as to the burden of proof; but finally the old rule of the Hillelites prevailed: "The estate remains according to its occupation," or, it might be said, "its presumption." That is, if the things given away remain in the possession of the donor or his heirs, the burden of proof is on the donee; if they are in the possession of the donee, the burden of proof is on the donor or his heirs. 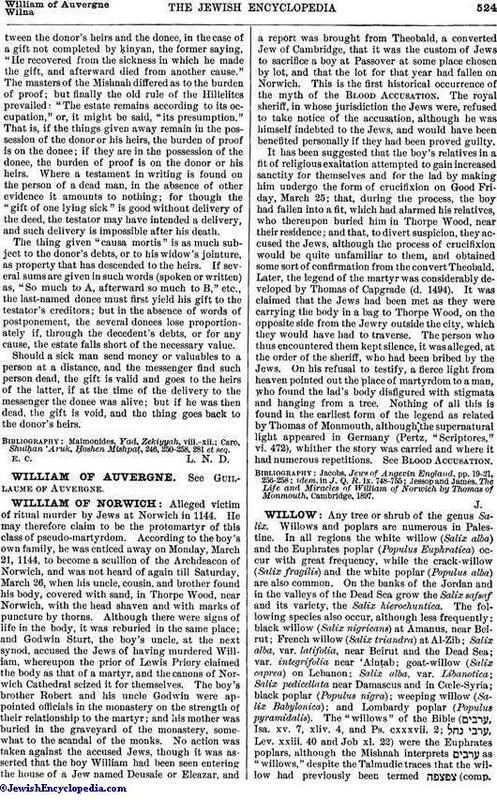 Where a testament in writing is found on the person of a dead man, in the absence of other evidence it amounts to nothing; for though the "gift of one lying sick" is good without delivery of the deed, the testator may have intended a delivery, and such delivery is impossible after his death. The thing given "causa mortis" is as much subject to the donor's debts, or to his widow's jointure, as property that has descended to the heirs. If several sums are given in such words (spoken or written) as, "So much to A, afterward so much to B," etc., the last-named donee must first yield his gift to the testator's creditors; but in the absence of words of postponement, the several donees lose proportionately if, through the decedent's debts, or for any cause, the estate falls short of the necessary value. Should a sick man send money or valuables to a person at a distance, and the messenger find such person dead, the gift is valid and goes to the heirs of the latter, if at the time of the delivery to the messenger the donee was alive; but if he was then dead, the gift is void, and the thing goes back to the donor's heirs. Caro, Shulḥan 'Aruk, Ḥoshen Mishpaṭ, 246, 250-258, 281 et seq.